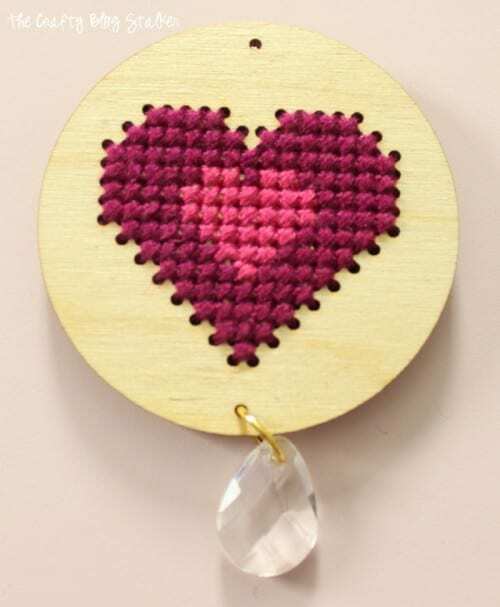 Learn how to make the Sew Much Love craft kit from Apostrophe S. An easy DIY jewelry tutorial idea for a cross-stitch heart pendant necklace. A heart is so much more than a cute symbol, a heart defines love and unity. I can tell you I love you just by making the shape of a heart with my fingers or tell you “I heart this necklace!” and you will totally know what I am saying. I love (pun intended) that there are so many ways to incorporate hearts into our actions, our words and even what we wear! 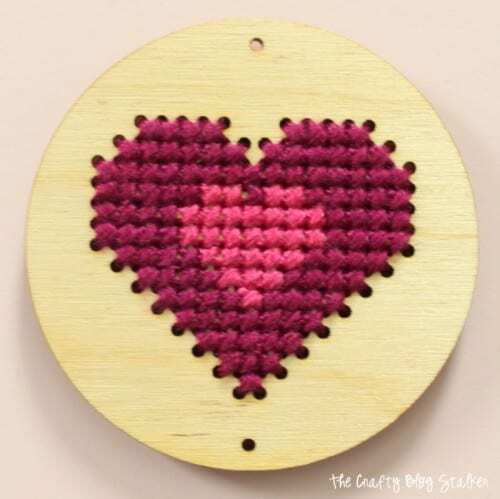 The Sew Much Love Pendant Necklace kit is available to purchase through Apostrophe S and includes almost everything you’ll need. This kit is no longer available for purchase. 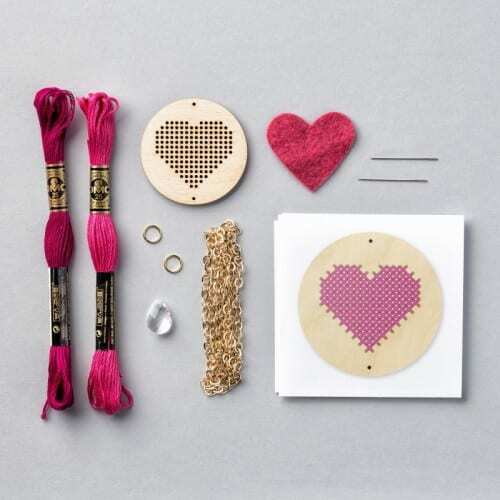 The kit comes with 3 patterns and a blank template to create your own pattern. I created my own heart inside a heart pattern. Feel free to design or use any pattern you like most. 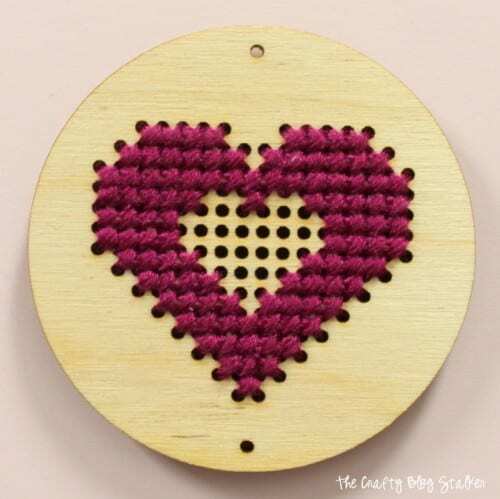 Cross-stitching is a fairly easy concept and is all built on creating an X stitch. In a square, there are four corners each with a hole. 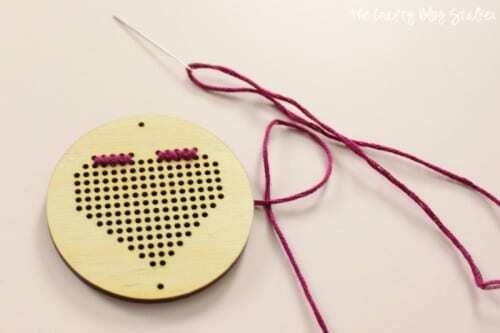 With thread and needle, go up through the hole in the top right corner and down through the hole in the bottom left. To create the cross then go up through the bottom right corner and down through the top left. You then have an X that fills that square. To create your design you fill a bunch of squares with Xs! It really is easier than it sounds. Promise. Tip: To keep the back smooth don’t tie your floss into knots to secure. Instead, leave some extra on your strand on the back side of the pendant and stitch over it to secure it in place. Here is the first completed row. Now keep going making sure to follow your pattern. You need to count your Xs, that is why it is called counted cross stitch. 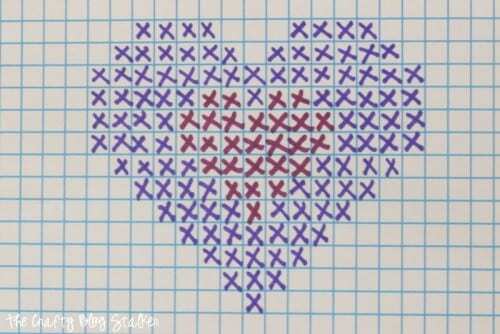 My pattern has a smaller heart inside the larger heart. I completed the outer heart first. 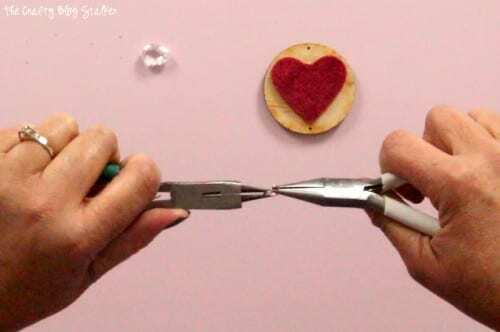 Then I stitched the inner heart. Super cute! I’m going to tell you right now the back isn’t going to be nearly as pretty as the front, and that’s okay. 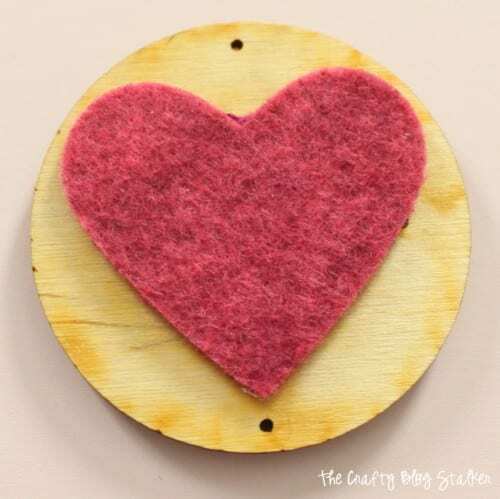 Included in the kit is a pre-cut felt heart that can be glued onto the back. Now you don’t have to be embarrassed if the pendant twirls around. It makes the back side pretty too! To finish the necklace, we’ll add the jewel to the bottom and attach to the necklace with jump rings. Tip: The best way to open a jump ring is by twisting the jump ring and not pulling open. Hold the ring with a pair of jewelry pliers in each and to open carefully twist the right forward. Loop the jewel and wood pendant onto the ring and then close with the same motion only in reverse, or twisting your right wrist back. Do the same with the second jump ring and loop anywhere onto the gold chain. The chain doesn’t have a clasp so there is no need to find the center. Here are a couple other finished necklaces so you can see what they look like with a different pattern. I’m going to wear this necklace to spice up my outfit for my Valentine’s date, but even after that, I can wear this necklace all year long. Hearts never go out of style. Do you have a piece of DIY jewelry that means something special to you? Share and leave a comment below! 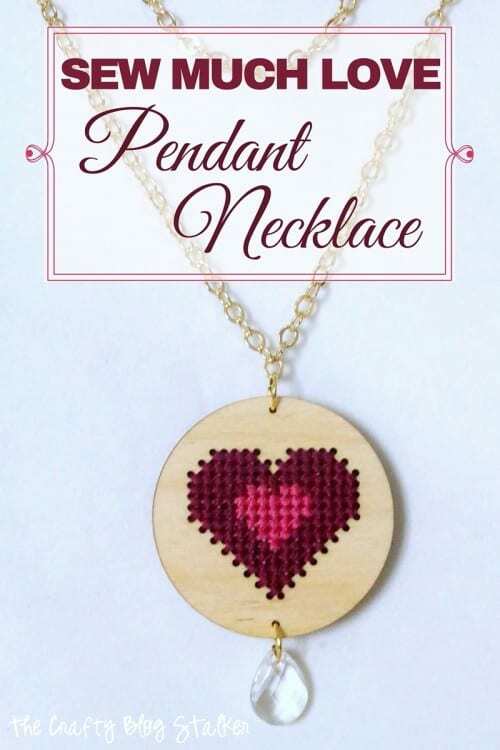 SAVE THIS EASY HEART PENDANT NECKLACE TO YOUR DIY JEWELRY PINTEREST BOARD! So cute! Thanks for linking up at Friday Finds! Aw, I love these necklaces! Thanks for linking up with Merry Monday! So cute! Perfect for valentines day 🙂 Thanks for linking up to my party!! What a Treasure Idea for a Special Friend, Teacher or Family member.